Sorry Candles in Canberra, National Day of Healing February 13, 2008. Our intern Shauni Tighe is from Australia and studying Indigenous relations at Montana State University. Her blog post here shares how Australia has dealt with its dark history with its Indigenous people and how efforts towards reconciliation have made a difference. In light of the recent racial tensions and debates in American society a lot of questions have been raised as to how America can ease this problem. Being an Australian here has been an interesting experience. I’ve gotten many questions lately on why Australia isn’t having the same issues. While Australia certainly has its share of racial tension with the Indigenous Australians, the question was put to me; How has Australia decreased its racial tension in society? What have we done there that America could look at and take note of? Similar to the United State’s Indigenous people, Indigenous Australians were subject to the European thought of ‘civilization’ and treated as British subjects with no rights to land. Upon Britain’s first landing the ideas of Social Darwinism and the Great Chain of Being were used in Australia and the Indigenous communities were subject to discriminatory laws that would see them lose their homes, their families and their culture. Children were taken from their mothers (Stolen Generation) and adults were required to sever all ties with other family members and their way of life in order to classify as an Australian Citizen and have a chance of surviving in the new (White) European Australia (Dog Tag Policy). Ever since these atrocities were committed contemporary Australian society has been trying to make amends with the Indigenous community and find a way to ease racial tensions within society. 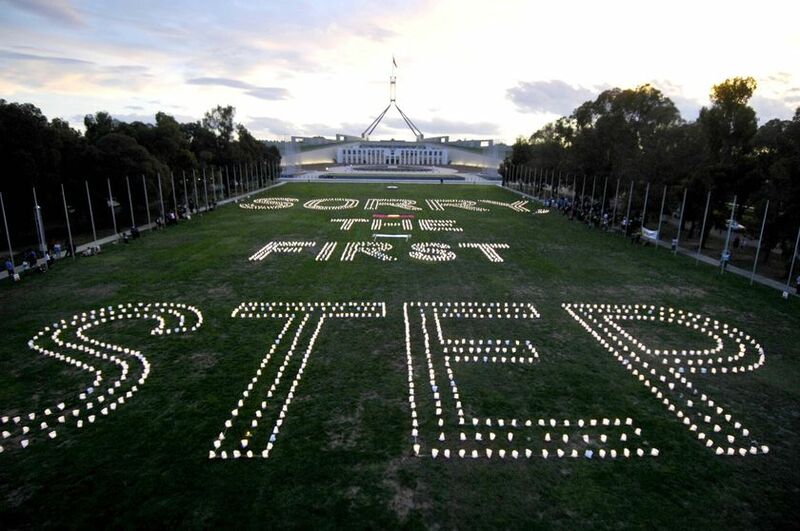 Socially Australia has seen such initiatives as the National Sorry Day, now known as the National Day of Healing, which was first held on the 26th May 1998 and saw over 24,000 Australian’s sign their name to Sorry books for the atrocities that had been committed, especially the removal of the Aboriginal children. These books were presented to the Indigenous Communities and the National Sorry Day became and annual event. There are also such initiatives as Reconciliation Australia, which works to educate people in schools, workplaces and communities to remove stereotypes and discrimination, and NAIDOC week, which occurs each July and dedicates the week to the recognition and celebration of the history, culture and achievements of Aboriginal and Torres Strait Islander people. Legally and Politically, the road to reconciliation has not always been as smooth. Within the legal systems of Australia steps have been trialed to help the Aboriginal community cope with the laws they were now subject to, this involved applying Indigenous Customary law, rather than Western Common law, however this was advised against in 1986 by the Australia Law Reform Commission that found issues of fairness for the non-indigenous too great to overcome. There are however some adjustments that can, and have been made, such as community elders sitting in on certain cases to advise magistrates for sentencing. Politically, Indigenous issues have been on a rollercoaster since the beginning of the twentieth century. In 1992 Primer Minister Keating acknowledged the wrongdoing of the Australian government by the taking of Indigenous children from their mothers in the Redfern Address. Four years later however in 1996 the Howard Government overturned this acknowledgement and denied that any damage had been done to the communities affected. Finally on the 13th February 2008 the issue was again brought forward in the Australian parliament, this time by new Prime Minister Kevin Rudd, who chose to apologize on behalf of the Australian Government. Since then legal claims for monetary reparation, as well as land title claims were brought forward to the courts and have been ongoing ever since. In my opinion simply the acknowledgement of wrongdoing by the Australian Government proved to ease the racial tensions within Australian society and provided us with that first step that is required toward reconciliation. So what do you think? Do you see some solutions here? Let us know your thoughts below. Lets get a dialogue going about what practical solutions might look like!